Mark Lewis, a famed libel and privacy lawyer, is leaving Britain. Worn down by years of anti-Semitic abuse and death threats, he has decided enough is enough. The 53-year-old plans to begin a new life in Israel with his partner, Mandy Blumenthal, by year's end. Both were born and raised in England. Both are very ready to leave. "I just want to get out of here. It's a massive thing to do but I've actually had enough," Lewis said. "People might dislike me in Israel because of my political views, might think I'm too right-wing or left-wing or whatever, but they are not going to dislike me for being Jewish." Two people have previously been imprisoned for threatening to murder him for being Jewish, Lewis said. Now, he said, he's reached the stage where he's "almost being desensitized to the threats" -- from both right and left -- such is their regularity. The couple's decision comes as accusations of anti-Semitism dog Britain's main opposition Labour Party and its leader, Jeremy Corbyn. At the same time, incidents of recorded anti-Semitism are near record levels. Lewis sees Corbyn as a catalyst for anti-Semitism rather than a threat in himself, saying the Labour leader has "moved the rock and it's the people who are crawling out from underneath it who are the problem." As a public figure and prominent pro-Israel voice, Lewis is an easy target for abuse on social media. The Community Security Trust (CST), a charity that fights anti-Semitism, recorded 727 anti-Semitic incidents in the first six months of 2018, the second-highest total ever marked for the first half of a year since the CST began recording anti-Semitic incidents in 1984. Only the total for the first six months of 2017 has been higher. 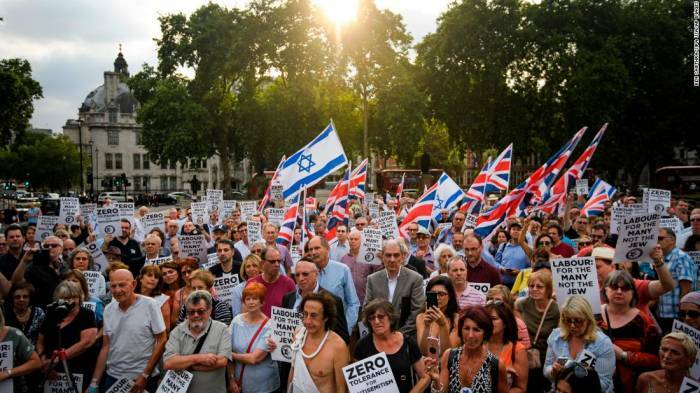 The current climate has shaken Britain's roughly 300,000-strong Jewish community. Since the UK took in some 90,000 Jews from the European mainland as World War II loomed, it has been considered one of the safest places in the world for Jews to live. Unlike in neighboring France, where a 2015 terror attack targeted a kosher supermarket and a Holocaust survivor was killed in her home in March, no lethal violence has occurred. But the conversation is changing. "We are seeing British Jews increasingly talking about leaving and also seeing signs of people actually leaving, not just to Israel, but also to the United States and Canada -- and Australia is a destination as well," said Gideon Falter, chairman of the Coalition Against Antisemitism (CAA). "Some of our volunteers from the coalition have become aware of so many incidents through their work with us that they have decided to leave and have moved with their families." It's hard to pin down exact figures on how many people have left or are actively considering uprooting their lives, since Israel is the only country globally that specifically tracks the immigration of Jews, Falter said. Yigal Palmor, communications director for the Jewish Agency for Israel, told CNN that 213 Jews had moved from Britain to Israel between January and June, up 9% compared with the same period last year. However, the total number of people who moved from the UK to Israel in 2017 was lower than in the three previous years. Palmor said the agency's UK office had also received more calls and that more people had opened files than last year but cautioned that this would not necessarily translate into more people moving to Israel, a process known as making "Aliyah". Nonetheless, he said, "Aliyah has become a popular conversation theme among many British Jews and many more are talking about it." Some British Jews who have the financial means have started to consider buying property in Israel, Falter said, even if they aren't planning an imminent move. Of course, not all can afford to relocate even if they want to. "It's a very sad state of affairs because we have all grown up here and for most us this is where our grandparents found refuge during the darkest days of humanity," said Falter.